On a crisp Saturday morning, the sky was painted in pure blue—not even a sign of a cloud across the sky. The wind was as gentle as the smile on her face. People were out on the streets in sleeveless shirts. My legs pedalled like a machine but the odometer ticked ever so slow—the main reason being the use of miles, not kilometres, in this part of the world. On the Pacific coastal highway, hordes of cyclists on slick carbon bicycles zipped past me and all I could do was admire their well-toned muscular calves from behind. From Seal Beach, I took a riverside bicycle route to Los Angeles City. I had one eye on the GPS device the whole time. “15 miles away, will be there between 5:00–5:30 pm!” I texted to Jamshed who had sent me an invitation on my Facebook page. “Fantastic, see you soon!” he replied. After navigating countless streets, I took the last turn to the left into a small residential street and darted a final glance at the GPS which showed my destination was only 500 feet away on the right. As my eyes scanned the house numbers painted on the curb of the road I heard the sound of clapping. People in their houses must be cheering for their favourite team on TV. The next thing I saw was a group of people standing in the middle of the road and applauding. I slowed down and looked behind but there was no one out there. As I approached closer, a Welcome to Los Angeles banner emerged behind people. I tipped my head to get a clearer view and surveyed everyone one by one—men, women, boys, girls, and children. Their faces, bright and shiny, radiated with joy. Their eyes sparkled with thousands of lights. Their smile, warm and soft, hugged me gently. For a moment I thought I was one of them—someone who had been out on a long journey—someone who was lost and was finally back home—but standing there I couldn’t find a familiar face among them. The home that I could remember was far away from here and almost abandoned. I felt someone had jumbled up my memory. It was a weird dream where everything was out of place. I pulled the brake levers hard. The bicycle came to a halt with the screeching sound of disc brakes. “Welcome, Kamran!” a female voice said. A smiling lady approached and forwarded her right hand to me. “Is this for real?” I asked her as I shook hands with her. “Yes, it is real!” she smiled. “Hello, Kamran. I am Jamshed, your host!” stepped in a handsome man who carried his one and half years old son in his arms. A warm welcome in LA! Back in 2003, when I visited my family in Pakistan for the first time after having left for Germany, my mom had my siblings decorate the street where our house was located in. As I walked through the doorstep, my sisters showered rose petals on me and mom garlanded me with marigold flowers. Since then, I stopped telling them in advance when exactly I would be coming home. Even when I finished my Germany to Pakistan bicycle trip in Layyah, no one knew about my arrival plans. Mom didn’t ask either. To be fair to her, the dead don’t speak. A few days ago, I received a second welcome in life, but this time, far away from home, and far from the finish line. There were no familiar faces, neither of mom nor of any of my seven siblings, only strangers. No one ran their fingers through my hairs this time, but the smiles were exactly same I had seen fifteen years ago. The question remained the same too. What have I done to deserve such a warm welcome? The invitation to stay came from a total stranger. Except for his name, I didn’t know anything about Jamshed, not even his origin. I had confirmed my arrival only a day before, but Jamshed was able to print a welcome banner with the correct arrival date on it. Meanwhile, he was also able to gather some friends and family members for the occasion. I shook hands with everyone and was surprised to see so many people. 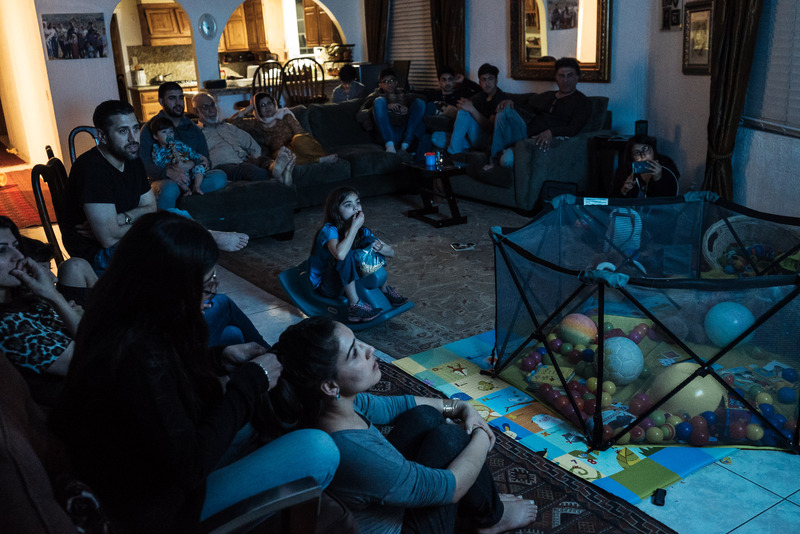 “We have 80–100 people in our family, but we kept it to a small gathering not to overwhelm you too much!” said Jamshed. They led me into their neat house. Inside the living room, a framed collage of family photos hung on the wall. We seated ourselves on sofas. Later, I met Jamshed’s parents who wore Shalwar Kameez dress. It was unusual but exciting to be in a home with so many people. One young girl bombarded me with some very good questions. “She is my daughter. She is half-Afghan, half Pakistani” said Jamshed’s sister who is a lawyer. Her husband, who is from Peshawar, was also there to welcome me. “Afghan community has strong ties with Pakistanis. Many Afghan women are married to Pakistani men!” Jamshed added. 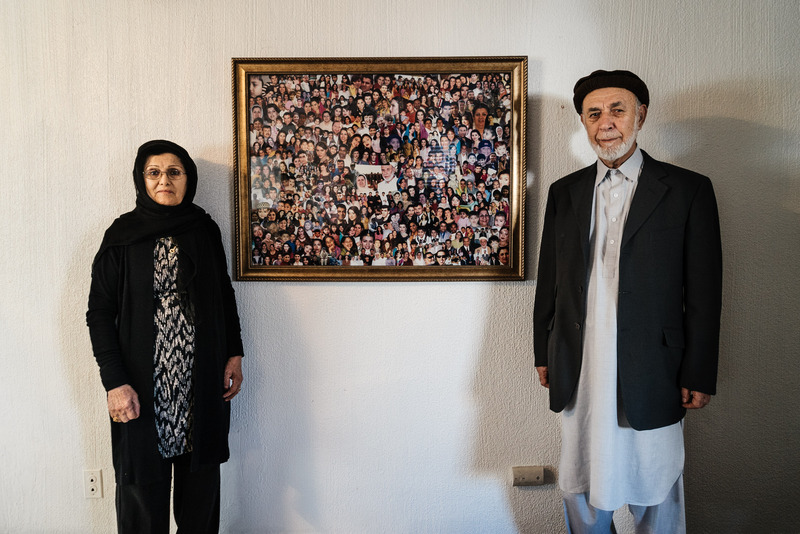 Jamshed’s parent with a collage of family photos. “The dinner is ready!” Jamshed’s sister announced. We all went to the dining room. Knowing I am a vegetarian, Jamshed’s family went to great lengths to ensure that I ate well. They prepared lentils, eggplants, mixed vegetables, salad, rice and other dishes. They had even ordered a veggie pizza. I ate until I could no more, even after the hosts had finishing eating. “Would you like to have some juice? Orange, mango? or tea?” Jamshed’s wife asked me. “Of course, mango juice. Pakistanis love mangoes!” said Jamshed’s sister before I could even answer. She was spot on. As everyone was excited to see the pictures of my journey, I decided to give them a presentation. I hooked up my MacBook to a giant Sony TV in the living room and showed them pictures and Cycling South America video. At the end of the video, they all clapped for me. Later, more guests came to visit and we replayed the video one more time. Screening of my “Cycling South America” video. When the guests left and kids went to bed, I stayed up late with Jamshed. “How do you see the relationship between Afghanistan and Pakistan?” I took a sip of tea and asked Jamshed. “It has nothing to do with people. It has to do with power and leadership. Now they are planning to build a border fence between Afghanistan and Pakistan, but it will be even more difficult than building a wall between the US and Mexico because same tribes live on both sides of the border. They don’t have a loyalty to Pakistan or to Afghanistan. They have a loyalty to their tribes. Each tribe has thousands of people in it and they are armed. The border doesn’t exist for them. For them, this is their home, this is their land. Afghanistan has natural resources worth trillions of dollars, but very little population. Pakistan has more population, but less natural resources. If both countries could collaborate—Pakistan providing the necessary tools and workforce to mine natural resources in Afghanistan—the two countries can prosper together a great deal.” Jamshed elaborated. “Afghanistan, before the Russian invaded, had a population of 15 million people. At the end of the war against the Russians, 2 million were dead, and a million people were mined— they had either lost their legs or arms. Some 200,000 women were turned into widows. About 7 million out of the original 15 million population became refugees—4 million went to Pakistan—3 million went to Iran. The country was completely destroyed, the infrastructures, the institutions, the agricultural land, everything. The only hope came from the refugees. Before the war, the number of Afghans who went abroad to study was very low. Only the elites could afford it. After experiencing wars and so many other horrible things, the Afghans have now seen the world. About 80% of young Afghan refugees who came here were able to graduate from the universities. They are doing well. They are successful businessmen, lawyers, engineers, and doctors. They wouldn’t have had this opportunity otherwise. “Sorry, I have to stop. My wife wants to ask a question” Jamshed pointed to her wife. “Do you get bored when you are cycling?” she asked. “Every day is different. The landscape is changing. I am meeting new people. Something interesting is happening all the time.” I replied. She nodded. We switched back to the original topic. “Coming back to the refugees, do you think that Afghanistan as a country is benefiting from its emigrants abroad?” I asked Jamshed. “It eventually will if the families living abroad continue to maintain strong ties with their families back home. Afghans have a strong bond with their culture and family. If we lose our culture, we will lose ties to our land.” Jamshed replied. “What can a normal person like me do in this regard?” I asked him. 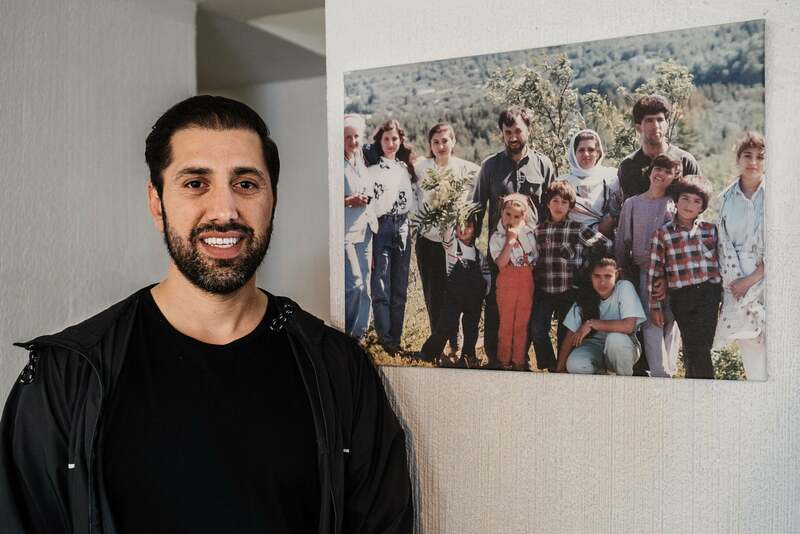 My host Jamshed with a family photo which was taken shortly after the family moved to the US. Well Written, A Bit Emotional, My Eyes Filled With Tears, Lovely People, Keep Going. They are an amazing family. Our lives crossed when they arrived in Maine in 1987. We will always be friends. This is what gives life a sense and makes it worth living! What a lovely family. alhamdulilah !! You have followers all over the world. the people, who really know the literal meaning of travelling and discovering people around the world, admires you! I always read your stories. It brings peace to my heart. It filled my eyes with tears. Ordinary people in both the countries have been suffering for last many decades but are very resilient. 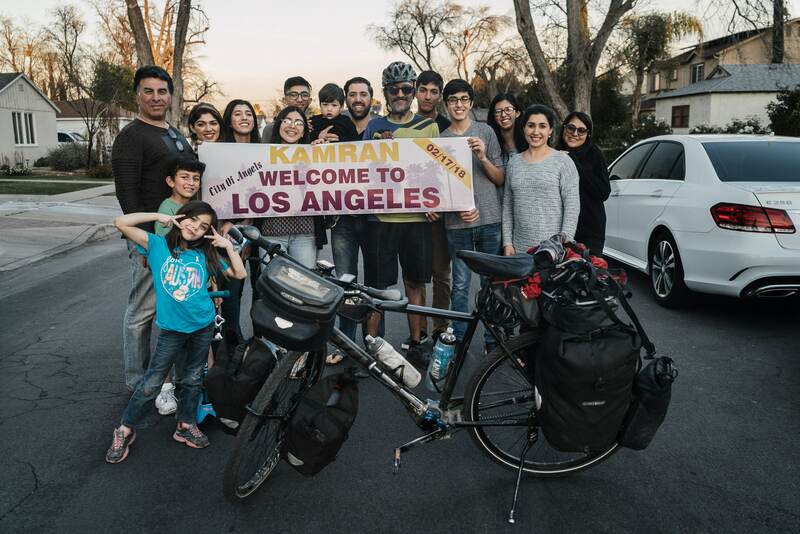 It also gave me hope that someday there will be peace in this region and people on both sides of the border will be willing to host each other the way this Afghan family hosted a Pakistani in California. Their love and warmth, I must say, is overwhelming and is a message of hope and peace for us all in this region. The originality of the people is lovely to the core if political and ethnic differences are removed. But sadly, we are animals although social, so we have to carry on with differences of wild beasts. It is so lovely to read all about the love and care of Afghans rendered to a roaming Pakistani in the far corner of the world.